Sadly, the game reflects the harsh reality many women face. The battle of the sexes wages on in this hilarious parody of competitive game shows; but this time the women must also overcome society's double standards. Christina Milian's color commentary highlights how the balance of power still leans in one direction. No surprise here! Laverne Cox apparently kills it as Dr. Frank-N-Furter. Jennifer Lopez would be proud. The reality of being Black AND Latino in the entertainment industry. 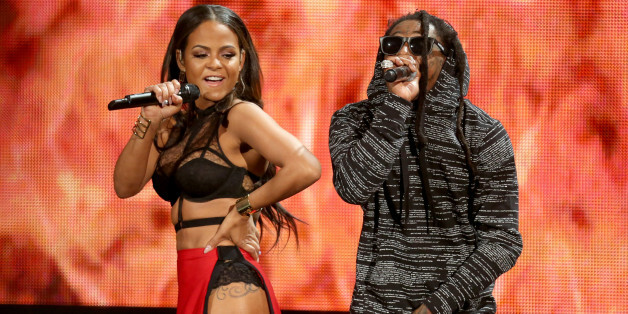 Christina Milian Talks 'Turned Up,' Tech and Celebrity Butts at CES 2016! Christina Milian on Domestic Abuse: "You Feel Like You're Alone"
She said that seeing other women talk about their experiences helped her move forward, and she gained strength from strong female mentors in her life, from her mother to entertainment icons like Oprah and Beyonce. "Staring down the barrel of a gun is the scariest thing you could ever experience." Watch what happened when Priscilla Presley, Toni Collette, Jacqueline Bissett, Kenny G, Mike Tyson, Reggie Miller, Deidre Hall, Galen Gering, David Foster, Chef Marcus Samuelsson, Angel Haze, Christina Milian and Stacy Schiff visited HuffPost live. "I didn't feel like I had to make a choice." Last September, the interweb was introduced to new heartthrob, Robby Blackwell, by popular producer DJ Marley Waters on a track called "Afterparty" featuring Christina Milian where the new swoon brought with him a remarkably strong, soulful, yet, seductive voice. “Some people were worried about me doing reality type stuff because they were like ‘then you can’t come back over to the other side.'" Vegas was alive this weekend with the highly anticipated Mayweather/Pacquiao fight at the MGM Grand Hotel and Casino. Casino hosts were snapping up tickets for their high rollers that were rumored to cost upwards of $100,000. It is not often that orthodox Judaism is showcased on television in a positive light. Having grown up with two parents who became frum and having gone to orthodox Jewish schools myself, I am really intrigued by those who are able to show a love for this type of religious observance.